Shark Diving 101. A beginners guide to shark diving. 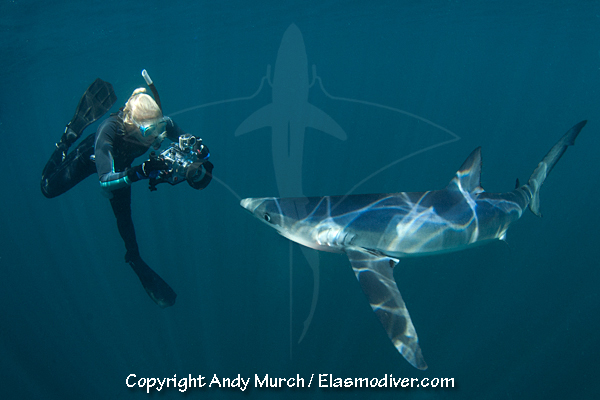 Many new divers dream about the day that they will see their first shark. Fish are beautiful and octopuses are fascinating, but nothing captures a diver’s attention like the sight of a large predatory shark materializing out of the depths, propelled purposefully forward by its powerful tail, its unblinking eye scanning the ocean for its next meal. Understandably, some divers are apprehensive about seeing sharks underwater but times have changed since the ‘Jaws’ era. With the realization that sharks pose very little threat to us while on scuba, divers now go out of their way to find places where diving with healthy shark populations is still possible and many attend organized shark feeds where they can get even closer to the lords of the sea. There are some fantastic locations in the Asia Pacific region where shark diving is virtually guaranteed. One of the best natural encounters is the drift dive at Rangiroa Atoll where hundreds of grey reef sharks hunt in the ripping currents during the tidal exchange. For a really dynamic shark feed, there are few places better than Beqa Lagoon in Fiji where enormous bull sharks are fed in front of awed guests and seven different shark species can be encountered on the same dive. Dress the part. There is an expression in the shark diving world called ‘yum yum yellow’. Although there is no solid evidence that sharks are attracted to one color over another, it’s a good idea to tone down your attire so that you don’t look like a confused school of fish. In addition, wear dark gloves, remove shiny objects and cover up any areas of bare skin. Stay calm and move slowly. Sharks respond to electromagnetic stimuli. Your racing heart is unlikely to elicit an attack but it might make the sharks more agitated. Streamlining and good buoyancy will also help. Thrashing around with your hands and finning erratically says ‘I’m wounded’. Look but don’t touch. But it’s so tempting! You’re kneeling on the bottom while an experienced shark feeder holds up fish after fish. Sometimes they even manhandle the animals to put them into a trancelike state called ‘tonic immobility’. Reaching out to a passing shark may seem innocent enough but that shark may think that you are offering them food. Stay out of harm’s way. Sharks are cautious creatures. 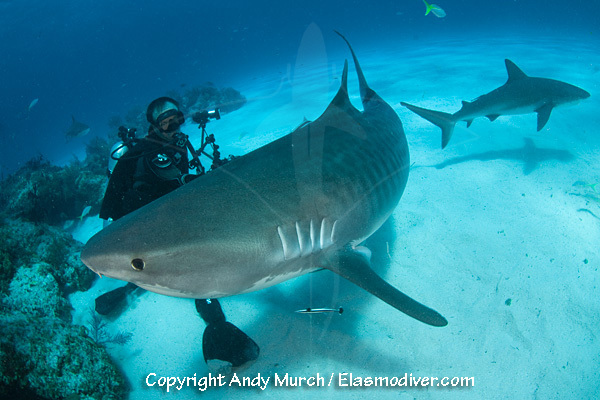 In a natural setting, passing sharks are very unlikely to closely approach divers. During a shark feed, they must overcome their inhibitions in order to get close to the food. Swimming next to or downwind of the chum will put you in their path as they swim up the scent trail. It will also make you smell like chum which could be counterproductive. Read the sharks. When sharks feel threatened they sometimes change their posture to warn other animals to back off. If you see any shark swimming with it pectoral fins pointed downwards and its back slightly arched or if the sharks around you have started to speed up and are making closer passes at the divers, it’s a good idea to slowly increase your distance. Sharks rarely take it to the next level as long as you give them enough space. Finally, be a good ambassador. Shark diving can be a rewarding and highly addictive aspect of our sport. Unfortunately, there are not as many sharks around as there used to be. Please tell the world about your amazing encounters but not about how you ‘cheated death with the man eating monsters’. If you want to help rebuild shark populations for generations of divers to come, sharks need an image makeover.